T-Mobile (stylised as ·T···Mobile·) is the brand name used by the mobile communications subsidiaries of the German telecommunications company Deutsche Telekom AG. The brand is active in Austria (under the subsidiary T-Mobile Austria), the Czech Republic (T-Mobile Czech Republic),the Slovak Republic (Slovak Telekom), the Netherlands (T-Mobile Netherlands), Poland (T-Mobile Polska), and the United States (T-Mobile US). The name was previously used by subsidiaries in other countries, including Albania (now Telekom Albania), Croatia (now Hrvatski Telekom), Germany (now Deutsche Telekom), Hungary (now Magyar Telekom), North Macedonia (now Makedonski Telekom), Montenegro (now Crnogorski Telekom), the United Kingdom (now EE Limited), Romania (now Telekom Romania), and Slovakia (now Slovak Telekom). Since 1999, Deutsche Telekom owned the holding company T-Mobile International AG for its mobile communications subsidiaries. From 2003 to 2007, T-Mobile International was one of Deutsche Telekom's segments beside the segments of 'Broadband/Fixnet', 'Business Customers' and 'Group HQ and Shared Services'. In 2009, Deutsche Telekom transformed its structure to adopt a regional setup (Germany, Europe, USA) by combining its previously separated fixed and mobile subsidiaries to form integrated local businesses, T-Mobile International itself was merged into Deutsche Telekom AG. When T-Mobile International AG existed, the holding company was based in Bonn, Germany and its subsidiaries operated GSM, UMTS and LTE-based cellular networks in Europe, the United States, Puerto Rico and the U.S. Virgin Islands. The company had financial stakes in mobile operators in both Central and Eastern Europe. Globally, T-Mobile International's subsidiaries had a combined total of approximately 230 million subscribers. T-Mobile International was the world's thirteenth-largest mobile-phone service provider by subscribers and the fourth-largest multinational after the UK's Vodafone, India's Airtel, and Spain's Telefónica. Germany's first mobile-communications services were radiotelephone systems that were owned and operated by the state postal monopoly, Deutsche Bundespost.It launched the analog first-generation C-Netz ("C Network", marketed as C-Tel), Germany's first true mobile phone network in 1985. On July 1, 1989, West Germany reorganized Deutsche Bundespost and consolidated telecommunications into a new unit, Deutsche Bundespost Telekom. On July 1, 1992, it began to operate Germany's first GSM network, along with the C-Netz, as its DeTeMobil subsidiary. The GSM 900 MHz frequency band was referred to as the "D-Netz", and Telekom named its service D1; the private consortium awarded the second license (now Vodafone Germany) chose the name D2. 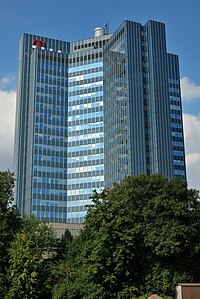 Deutsche Bundespost Telekom was renamed Deutsche Telekom AG on January 1, 1995 as part of phase two of the German communications reform. This process of deregulation continued in November 1996, when DT was privatized and had the largest European IPO at the time, with the stock abbreviation 'DT 1'. In 1999, T-Mobile International AG & Co. KG holding company was founded (later renamed to T-Mobile International AG). 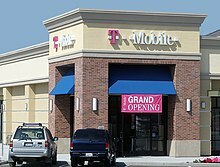 In 2002, as DT consolidated its international operations, it anglicized the T-Mobil name to T-Mobile. On July 5, 2005 Deutsche Telekom transformed its structure and adopted a regional setup (Germany, Europe, USA). Where available, the local mobile businesses were combined with the respective local wireline businesses to follow the integrated business approach. In 2009 T-Mobile International AG was merged into Deutsche Telekom AG. T-Mobile entered the Croatian market in October 1999 when DT initially acquired a thirty-five percent interest in Hrvatski telekom, including its cell phone service provider Cronet. Two years later, DT signed an agreement with the Croatian government to acquire the additional 16 percent needed for a majority holding. In January 2003, Hrvatski Telekom assembled all of its mobile activities under a single brand HTmobile. Finally, in October 2004, HTmobile became T-Mobile Hrvatska, or T-Mobile Croatia, thus joining the global T-Mobile family also by name. Since January 1, 2010, Hrvatski Telekom and T-Mobile Croatia merged into one company on the Croatian market under the name Hrvatski Telekom (in English: Croatian Telecom); the T-Mobile brand remained active in the mobile-business area and T-Com in the fixed-business area until 2013 when they were replaced by unified brand "Hrvatski Telekom". T-Mobile was previously known as Paegas in the Czech Republic. T-Mobile Czech Republic a.s. has been operating in the Czech market since 1996. As of December 31, 2014, 6 million customers were using T-Mobile services. T-Mobile Czech Republic a.s. operates a public mobile communications network on the GSM standard in the 900 and 1800 MHz bands and is also authorized to operate a UMTS network. On October 19, 2005, T-Mobile was the first operator in the Czech Republic to launch this third-generation technology under the name Internet 4G. On July 1, 1992, Deutsche Bundespost Telekom's DeTeMobil subsidiary began operating Germany's first GSM 900 MHz frequency cellular network, which the organization referred to as D-Netz. Digital GSM services were marketed under the "D1" brand and DeTeMobil continued to sell analog cellular services concurrently under the existing C-Tel brand. In 1994, DeTeMobil introduced short message service (SMS) services. On May 1, 2004, the same day as Hungary joined the European Union, the former company, named Westel (which was owned entirely by the former Matáv) changed its name, and the entire marketing. Westel was the most popular cellphone network in Hungary at the time. The company was called T-Mobile Hungary, but after some financial decisions, as with the other T- companies, it formed to Magyar Telekom Nyrt. Mobil Szolgáltatások Üzletág (Hungarian Telekom, Mobile Services Business Unit), and its branding started to use Telekom instead of T-Mobile. T-Mobile also provides high-speed services, like EDGE, 3G, and HSDPA in Hungary's major cities. In Republic of North Macedonia, T-Mobile was previously known as Mobimak. The company has been operating in the Macedonian market since 1996. On 7 September 2006, Mobimak accepted the international T-Mobile branding. By June 2007, T-Mobile reached one million subscribers, out of which 85 percent were active and using their services. T-Mobile MK covers 98 percent of the population. It has a GSM 900 licence, offers GPRS, MMS and mobile internet services using T-Mobile HotSpots and has implemented the EDGE fast mobile internet specification. T-Mobile Macedonia applied for a UMTS licence on 1 August 2007. From 1 July T-Mobile ceased to exist as a legal entity and was replaced by the Telekom brand. The carrier name is now Telekom.mk. The codes are 070/071/072. MoNet GSM launched on July 1, 2000, as part of Telecom Montenegro. It became an independent incorporated limited-liability company a month later, on 1 August 2000. The company currently[when?] holds around 34 percent of the Montenegrin market and uses GSM 900, GPRS, and EDGE technologies. Since 21 June 2007, 3G/UMTS services have been available in larger cities as well as on the coast. T-Mobile offered both pay-as-you-go and pay-monthly contract phones. T-Mobile launched their 3G UMTS services in the Autumn of 2003. T-Mobile UK's network was also used as the backbone network behind the Virgin Mobile virtual network. In late 2007, it was confirmed that the merger of the high-speed 3G and HSDPA networks operated by T-Mobile UK and 3 (UK) was to take place starting January 2008. This left T-Mobile and 3 with the largest HSDPA mobile phone network in the country. In 2009, France Télécom's Orange and DT, T-Mobile's parent, announced they were in advanced talks to merge their UK operations to create the UK's largest mobile operator. In March 2010, the European Commission approved this merger on the condition that the combined company sell 25% of the spectrum it owns on the 1800 MHz radio band and amend a network sharing agreement with smaller rival 3. The merger was completed the following month, the new company's name later being announced as EE. Orange and T-Mobile continued as separate brands in the market until 2015, both run by the new parent company. T-Mobile UK and Orange UK announced on 15th February 2015 the sale of EE Limited to BT Group for £12.5B and to take shares of 12% within the BT Group as part of the deal. T-Mobile US provides wireless voice, messaging, and data services in the United States, Puerto Rico and the U.S. Virgin Islands under the T-Mobile, Metro by T-Mobile brands. The company operates the third largest wireless network in the U.S. market with over 65.5 million customers and annual revenues of $32 billion. Its nationwide network reaches 98 percent of Americans, through its EDGE 2G/HSPA 3G/HSPA+ 4G/4G LTE networks, as well as through roaming agreements (see section: Radio frequency spectrum chart). As of 2018[update], J. D. Power and Associates, a global marketing-information-services firm, ranked the company highest among major wireless carriers for retail-store satisfaction four years consecutively and highest for wireless customer care two years consecutively. The company owns licences to operate a 1900 MHz GSM PCS digital cellular network and AWS UMTS digital cellular networks using 600MHz, 700MHz, 850MHz, 1700 MHz and 2100 MHz covering areas of the continental U.S., Alaska, Hawaii, Puerto Rico and the U.S. Virgin Islands . It provides coverage in areas where it does not own radio frequency spectrum licenses via roaming agreements with other operators of compatible networks. In addition to its cellular mobile network, T-Mobile US operates a nationwide Wi-Fi Internet-access network under the T-Mobile HotSpots brand. The T-Mobile HotSpot service offers access to a nationwide network of approximately 8,350 access points, installed in venues such as Starbucks coffeehouses, FedEx Office Office and Print Centers, Hyatt hotels and resorts, Red Roof Inns, Sofitel hotels, Novotel hotels, the airline clubs of American Airlines, Delta Air Lines, United Airlines and US Airways, and airports. T-Mobile US, Inc. traces its roots to the 1994 establishment of VoiceStream Wireless PCS as a subsidiary of Western Wireless Corporation. Spun off from parent Western Wireless on 3 May 1999, VoiceStream Wireless Corporation was purchased by Deutsche Telekom on 31 May 2001, for $35 billion and renamed T-Mobile USA, Inc. in July 2002. This legacy is reflected in some mismatch between US and German T-Mobile service, notably the frequency mismatch making phones inoperative in the other country, and picture messaging issues (non-delivery of pictures in text messages) between those networks. After a failed attempt by AT&T in 2011 to purchase the company in a $39 billion stock and cash offer (which was withdrawn after being faced with significant regulatory and legal hurdles, along with heavy resistance from the U.S. government), T-Mobile USA announced its intent to merge with MetroPCS Communications, Inc., the sixth largest carrier in the U.S., to improve its competitiveness with other national carriers; the deal was approved by the Department of Justice and Federal Communications Commission in March 2013. The merger agreement gave Deutsche Telekom the option to sell its 72% stake in the merged company, valued at around $14.2 billion, to a third-party before the end of the 18-month lock-up period. On 1 May 2013, the combined company, now known as T-Mobile US, began trading on the New York Stock Exchange as a public company. On April 29, 2018, T-Mobile and Sprint announced in a $26 billion deal that they would merge to form a new company under the name T-Mobile. T-Mobile, specifically the T-Mobile US subsidiary in the United States, renames Safeco field in Seattle to T-Mobile Park starting Jan 1, 2019, for 25 years. T-Mobile, specifically the T-Mobile US subsidiary in the United States, holds the naming rights to T-Mobile Arena on the Las Vegas Strip near Las Vegas. Since 2016, the wireless company sponsors the Home Run Derby. ^ a b c d e f "Deutsche Telekom: Worldwide". www.telekom.com. Retrieved 25 May 2016. ^ "Annual Report 2006 PDF (see page 76)" (PDF). www.e-paper.telekom.com. Deutsche Telekom AG. Retrieved 2017-01-24. ^ a b "Deutsche Telekom - The 2009 financial year. Toward the new Deutsche Telekom. - Group organization". www.annualreport-archive.telekom.com. Retrieved 2017-01-24. ^ Goransson, Paul; Greenlaw, Raymond (2011-04-01). Secure Roaming in 802.11 Networks. Newnes. ISBN 9780080548944. ^ "PostUmwG - nichtamtliches Inhaltsverzeichnis". www.gesetze-im-internet.de. ^ a b c "Deutsche Telekom: Telecommunication milestones". www.telekom.com. ^ "GG - Einzelnorm". www.gesetze-im-internet.de. ^ a b "Privatization and Deregulation". www1.american.edu. ^ Waesche, Niko Marcel (2003). Internet Entrepreneurship in Europe: Venture Failure and the Timing of Telecommunications Reform. Edward Elgar Publishing. pp. 162–164. ISBN 978-1-84376-135-8. ^ "INTERNET 4G - THE FIRST CZECH UMTS". T-Mobile Czech Republic a.s. Archived from the original on 2013-12-03. Retrieved 2013-11-30. ^ "T-Mobile ist jetzt Telekom" (in German). Telekom Deutschland GmbH. 2010-04-01. Retrieved 2012-06-30. ^ "About T-Mobile in Poland". t-mobile.pl. Retrieved 2012-03-24. ^ "Ranges of frequencies allocated for mobile network operators". uke.gov.pl. Archived from the original on 2015-03-21. Retrieved 2015-03-15. ^ Zielińska, Urszula; Dec, Łukasz (2011-01-17). "Era zmieni markę i kolor, zaoferuje telewizję" (in Polish). Presspublica. Retrieved 2012-03-24. ^ "Koniec modernizacji sieci T-Mobile już we wrześniu". t-mobile-trendy.pl. Archived from the original on 2015-03-17. Retrieved 13 March 2015. ^ Powered by DMflex WebGen --- www.dmflex.com (2011-09-21). "History ~ GSM World". Gsmworld.com. Archived from the original on 2011-05-05. Retrieved 2012-03-24. ^ "Mercury One-2-One Challenges the U.K. Cellular Competition". Mobile Phone News (via FindArticles). 13 September 1993. ^ "One 2 One Sale Agreed". BBC News. 1999-08-06. Retrieved 2010-03-27. ^ "One 2 One To Rebrand as T-Mobile". brandrepublic.com. ^ "Orange and T-Mobile Cleared for Mobile Merger by EU". BBC News. March 1, 2010. Retrieved March 1, 2010. ^ "Deutsche Telekom and France Telecom Announce Completion of UK Merger" (Press release). Newsroom.orange.co.uk. 2010-04-01. Archived from the original on 2012-04-04. Retrieved 2012-03-24. ^ "Orange and T-Mobile Unveil Joint Venture Name, Team, Vision and Plans" (Press release). Newsroom.orange.co.uk. 2011-05-10. Archived from the original on 2012-03-18. Retrieved 2012-03-24. ^ "T-Mobile Rises to 3rd Place, Beats Sprint in Carrier Ranking". eweek.com. ^ "Sprint announces Q1 2015 earnings – It's still ahead of T-Mobile, but only just". TmoNews. May 5, 2015. Retrieved May 5, 2015. ^ "T-Mobile Delivers Unparalleled Financial Results - Tops Revenue and Adjusted EBITDA Estimates". Archived from the original on 2018-09-25. Retrieved 2016-05-09. ^ "4G LTE Network w/ Fast Data | Test Drive Our 4G LTE Network | T-Mobile". T-Mobile. Retrieved 22 October 2015. ^ "J.D. Power Awards T-Mobile For Best Customer Service". DSL Reports. Retrieved 19 May 2013. ^ "T-Mobile USA receives J.D. Power award". Wireless Industry News. Archived from the original on 2013-08-18. Retrieved 19 May 2013. ^ "T-Mobile Ranks Highest in J.D. Power Customer Care Survey". BrightHand.com. Retrieved 19 May 2013. ^ "T-Mobile wins J.D. Power award for customer satisfaction, again". PhoneDog. Retrieved 19 May 2013. ^ "T-Mobile network bands & technologies". T-Mobile. Retrieved 4 Oct 2018. ^ "T-Mobile HotSpot Location" Archived 2013-03-12 at the Wayback Machine. t-mobile.com. ^ "VoiceStream Will Now Be Called T-Mobile". Seattle Post-Intelligencer. 2002-07-18. Archived from the original on 2011-04-28. Retrieved 2011-04-27. T-Mobile, formerly VoiceStream, made its debut yesterday with television, radio and newspaper advertisements in California and Nevada. Over the next few months, the VoiceStream brand will be completely phased out in other cities in favor of T-Mobile. ^ Lee, Timothy B. (2011-12-19). "AT&T admits defeat on T-Mobile takeover, will pay $4 billion breakup fee". Ars Technica. Retrieved 2013-07-09. ^ "T-Mobile USA, MetroPCS to combine". Chicago Tribune. Retrieved 3 October 2012. ^ Lloyd, Craig. "T-Mobile, MetroPCS merger gets approval from Department of Justice". Slashgear. Retrieved 13 March 2013. ^ Volpe, Joseph. "FCC approves T-Mobile - MetroPCS deal, deems the merger will 'serve the public interest'". Engadget. Retrieved 13 March 2013. ^ Rahn, Cornelius. "Deutsche Telekom Can Sell T-Mobile Before Share Lock-Up Ends". Bloomberg. Retrieved 19 May 2013. ^ Rodriguez, Salvador (2013-05-01). "Combined T-Mobile-MetroPCS debuts on N.Y. Stock Exchange as 'TMUS'". Los Angeles Times. Retrieved 2013-07-09. ^ "T-Mobile to buy Sprint in $26bn merger". BBC News. 2018-04-29. Retrieved 2018-04-30. ^ Alex Wagner , TmoNews. "T-Mobile sponsoring 2016 Home Run Derby, offering VR experience and more to celebrate." July 7, 2016. Retrieved August 22, 2017.